Once you open up your personal checking account with CBBC Bank, you will have your new debit card in your hand before you leave the branch. You will also be able to choose your own PIN number when the card is created. This service is available at ALL of our area branches. Stop by any branch to submit an application for a debit card. *Cashback rewards and foreign ATM reimbursements require participation in CBBC Bank's Cashback Checking account plan. Refer to account disclosures for details. 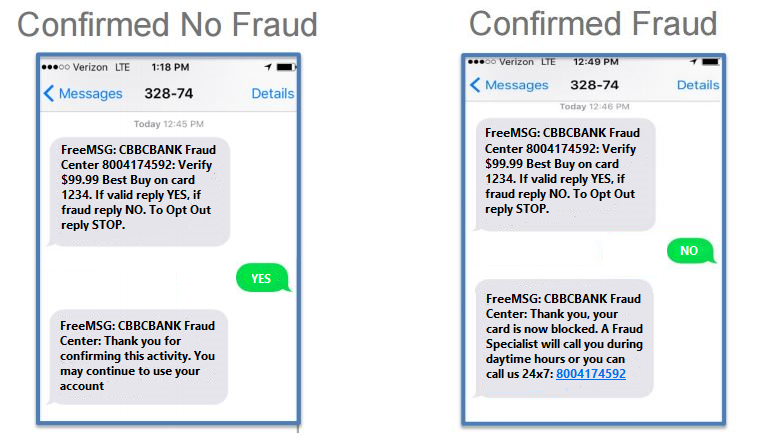 CBBC Bank Debit/ATM Fraud Shield uses two innovative ways to detect potential fraudulent activity on your card. The first is a texting service, powered by CardGuardian®, that puts the fraud detection in your hands by bringing specific transaction types to your attention because only you know where you have spent your money; you must enroll online to use the CardGuardian® service. The second is a 24/7 card monitoring system, powered by FICO Falcon®, which will notify you via email, text, and automated phone call in the event that we detect possible fraud; it comes free of charge to all cardholders. Below are examples of the types of alerts that you will receive from CBBC Bank. CardGuardian® alerts work by bringing specific transaction types to your attention for review without immediately freezing your card. If it alerts you to a transaction that you have performed, you simply ignore the alert. If it alerts you to a transaction that you have not performed, you respond with the code provided in the text to freeze your card, and we will be in touch with you within the next business day to resolve the issue. These alerts come from phone number 27576, and we recommend you saving this number to your contacts as "CBBC Bank CardGuardian." 8 or more transactions in a rolling 24-hour period. For example, 1 pm on Monday to 1 pm on Tuesday. CardGuardian® alerts are self-enroll only. 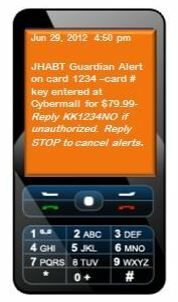 Message and data rates may apply for using CardGuardian® alerts. FICO Falcon is the technology that our fraud team uses to monitor debit card activity 24/7. In the event that we detect possible fraud, your card will be frozen, and you will receive the following communication from us. 1. You will immediately receive the following email notification from FraudShield@cbbcbank.com to the email address we have on file for you, which includes the option to reply with "fraud" or "no fraud." 2. If there is no response to the email after one minute has passed, then you will receive the following free text alert from phone number 32874, which also has the "fraud" or "no fraud" options. We recommend that you save this number to your contacts as "CBBC Bank Fraud Shield." 3. 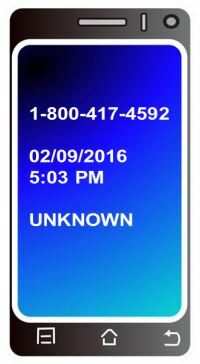 If there is no response to the email or text after 20 minutes have passed, then you will receive an automated phone call to confirm or deny the suspected card activity from phone number 1(800) 417-4592. This number will come through as an unknown number, so we recommend saving this number to your contacts as "CBBC Bank Fraud Shield." The call will also give you the option to speak with a fraud analyst. If you do not respond to any of these three alerts, your card will remain blocked to protect your account until we can get in touch with you. Occasionally we have to place transaction blocks on specific merchants when we experience high volumes of fraud. If you attempt to perform a transaction at one of these merchants, then we will attempt to contact you via email or text message. No phone call will be placed for these alerts. However, you will have the opportunity to review the transaction for fraudulent activity. If the transaction is valid, you may contact the bank during business hours to find out why the transaction was declined. 1. You will immediately receive the following email notification from FraudShield@cbbcbank.com to the email address we have on file for you, which includes the option to reply with "fraud" if you did not attempt the transaction. 2. If there is no response to the email after one minute has passed, then you will receive the following free text alert from phone number 32874, which also has the option to confirm "fraud" if the transaction is not yours. 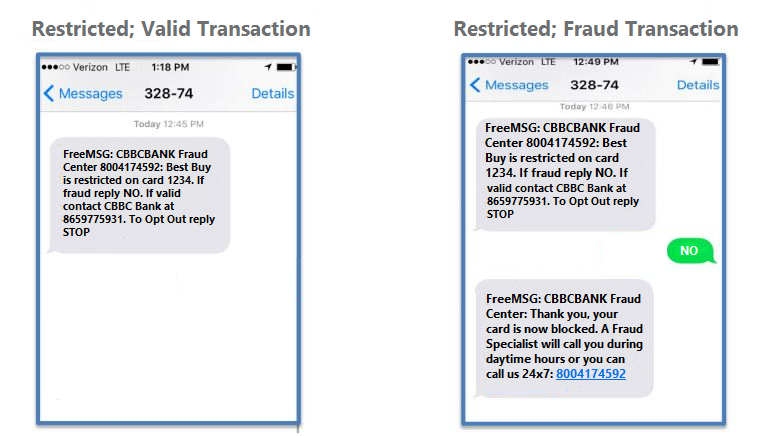 We recommend that you save this number to your contacts as "CBBC Bank Fraud Shield." Also feel free to check out our FAQ's page for commonly asked questions associated with our Fraud Shield service. What is a "chip"? 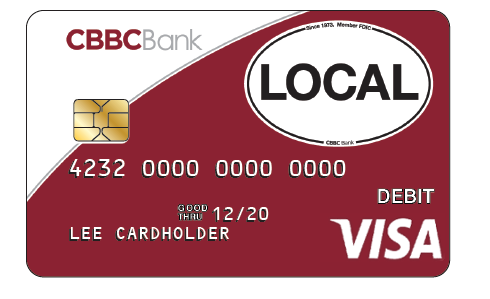 CBBC Bank debit cards are being issued containing a small microchip just above the printed account number on your card. Chip cards allow for an extra layer of security for face to face purchase transactions. 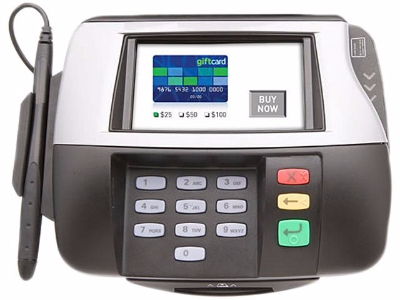 When used at an enabled terminal, the microchip in your debit card creates a one-time use code that the merchant sends to the card company to process your transaction. The card company is able to match this code to your card information and pay the merchant. With traditional debit cards, information stored in the magnetic strip and transmitted to card companies from merchants includes your name, full card number, card expiration date, and security code (the numbers found on the back on the card). If a card was compromised, either by swiping through a skimming device or a data breach, all of this information could be used by criminals for unauthorized purchases from your bank account. By using the new chips to complete face to face transactions, none of this information is sent through payment systems thus lessening the likelihood of a card compromise. When you are ready to make a purchase, you will insert the card into the merchants chip-enabled terminal at the bottom of the key pad. The terminal will read the microchip to access a one time use code for your purchase. While it is doing this you will be asked for your PIN number. The card will need to remain in the terminal until the transaction is finished processing. Once it is done, the terminal will alert you and the screen will tell you that you may now remove your card. Microchips can only work to protect your account information when you are making a purchase face to face and the merchant has a chip-enabled terminal. Transactions made with online merchants still require you to enter your card number and other information to complete the transaction. Please refer to our useful tips tab above to learn more about protecting your card information while making an online purchase. Keeping your Debit/ATM card secure is a major responsibility for you. Here are some tips we advise you to follow. Protect your Debit/ATM card and keep it in a safe place. Treat it as you would cash. Keep your Personal Identification Number (PIN) secret. Never write it down, especially anywhere on the card itself. Never disclose information about your card in response to an unsolicited email or phone request. CBBC Bank will not ask for this information in an email. Review your bank statements or regularly check your account through BankOnLine to verify if any unauthorized transactions have occurred. Report lost or stolen cards, as well as any unauthorized transactions on your account, to CBBC Bank immediately. Do not allow anyone else to enter your PIN for a transaction, even if they may be helping you. Always stand between the Point of Sale (POS) terminal and any waiting individuals, so that you block their view as you enter your PIN to complete your transaction. When you are using an outdoor POS terminal, such as at a gas station, observe your surroundings. Inspect the terminal itself for possible skimming devices (this may be an attachment or alteration to the card reader or the keypad). If anything looks suspicious, either in the area or at the terminal, do not initiate a transaction. Leave the area immediately. After making your purchase, always get a receipt. Verify receipts against your account at the earliest convenience. When at an ATM, be aware of your surroundings, especially at night. 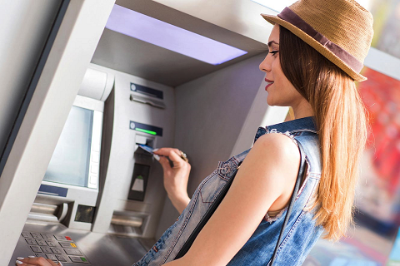 Only use an ATM in an area that is well lit, and the view of the machine is unobstructed. If this is not the case, leave the area and conduct your transaction at another location. If using a drive-up ATM, keep all doors locked, passenger windows up, and your engine running. Park close to the terminal and observe the entire area from your car before initiating a transaction. If anything appears out of place, leave the area at once. Visually inspect the ATM for possible skimming devices. If an ATM appears to have attachments or alterations to the card reader or keypad, do not use the machine. Make sure that no one is nearby that can view your PIN or transaction amount. Minimize time spent at the ATM. Put your cash, card, and receipt away after your transaction. Count your money later and always keep your receipt. Start from a trusted website instead of shopping with a search engine. Search engines can be rigged to lead you away from where you actually want to go, especially once you get past the first few pages of links. If you know the site, there is less chance of it being a rip off. Be very cautious of misspellings or sites using a different top level domain (for example .net as opposed to .com). Never, ever buy anything online from a site that doesn't have SSL (secure sockets layer) encryption installed. You will know if the site has SSL encryption due to the fact the web address begins with https:// instead of just http://. Also a locked padlock icon will be present, usually next to the website address or in the status bar at the bottom of your browser dependent on what browser you use. Never give card information out in an email. No online merchant would need your social security number or date of birth to conduct normal business. If crooks were to get this information in conjunction with your card number, they could do a lot of damage. Plus the more information they have, the easier it is to steal your identity. Don't wait for bills or statements to come in to check your transactions. 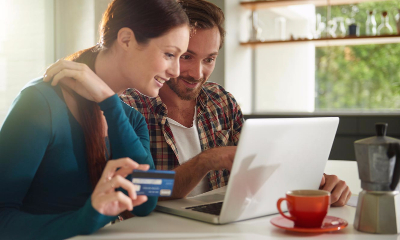 Log into your BankOnLine regularly, more frequently around the holidays, to make sure everything you are seeing is yours - even from regular places you shop. If you find something you don't recognize, contact the bank immediately. Make sure your anti-virus and malware software is up to date and working properly. Tech-savvy thieves do not just wait for you to give them your information. They will try to slip something onto your system to help them along, most often through legitimate looking email attachments or vulnerabilities in your security.